Acknowledged author Jacqueline Bauman-Waengler wrote Articulation and Phonology in Speech Sound Disorders: A Clinical Focus (5th Edition) comprising 448 pages back in 2015. Textbook and etextbook are published under ISBN 0133810372 and 9780133810370. 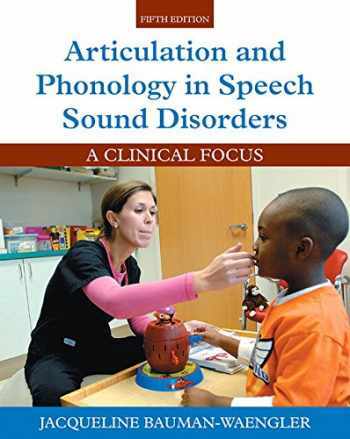 Since then Articulation and Phonology in Speech Sound Disorders: A Clinical Focus (5th Edition) textbook received total rating of 3.5 stars and was available to sell back to BooksRun online for the top buyback price of $58.97 or rent at the marketplace. Note: This is the bound book only and does not include access to the Enhanced Pearson eText. To order the Enhanced Pearson eText packaged with a bound book, use ISBN 0134092627. This comprehensive book ties strong academic foundations directly to their clinical application for speech/language therapists working with speech sound disorders. Each chapter presents tools to help readers bridge the gap between theoretical issues and clinical applications by presenting Clinical Applications, Clinical Exercises, Case Studies, and a section called Think Critically, which asks students to further apply specific clinical concepts. Test Yourself multiple choice questions appear at the end of each chapter and are ideal for review and assessment of the knowledge presented in the chapters, and Further Readings allow readers to continue to expand their knowledge. The new Fifth Edition of Articulation and Phonology in Speech Sound Disorders reflects the current use of the term “speech sound disorder,” an umbrella term for what was previously noted as articulation- and phonemic-based disorders. Also included is an in-depth review of the phonotactics of American English; increased focus on topics which have gained recognition with the field; an expanded chapter on the Treatment of Phonemic-Based Speech Sound Disorders (Chapter 10); an updated chapter on Speech Sound Disorders in Selected populations; and the addition of several videos in the Enhanced Pearson eText which support the content of the chapter and allow more clinical and transcription exercise for students. Improve mastery and retention with the Enhanced Pearson eText* The Enhanced Pearson eText provides a rich, interactive learning environment designed to improve student mastery of content. The Enhanced Pearson eText is: Engaging. The new interactive, multimedia learning features were developed by the authors and other subject-matter experts to deepen and enrich the learning experience. Convenient. Enjoy instant online access from your computer or download the Pearson eText App to read on or offline on your iPad® and Android® tablet. * Affordable. The Enhanced Pearson eText may be purchased stand-alone or with a loose-leaf version of the text for 40-65% less than a print bound book. * The Enhanced eText features are only available in the Pearson eText format. They are not available in third-party eTexts or downloads. *The Pearson eText App is available on Google Play and in the App Store. It requires Android OS 3.1-4, a 7” or 10” tablet, or iPad iOS 5.0 or later.